Ocean Front Kahana Paradise! This is a Must See! Location, location, location!!! Wake up in the morning at this prime third-floor Hololani Resort end unit and you are oceanside. Have your first cup of coffee on the lanai not 50 feet from the water, while listening to the soft lapping of the waves and enjoying Maui's cool trade winds. 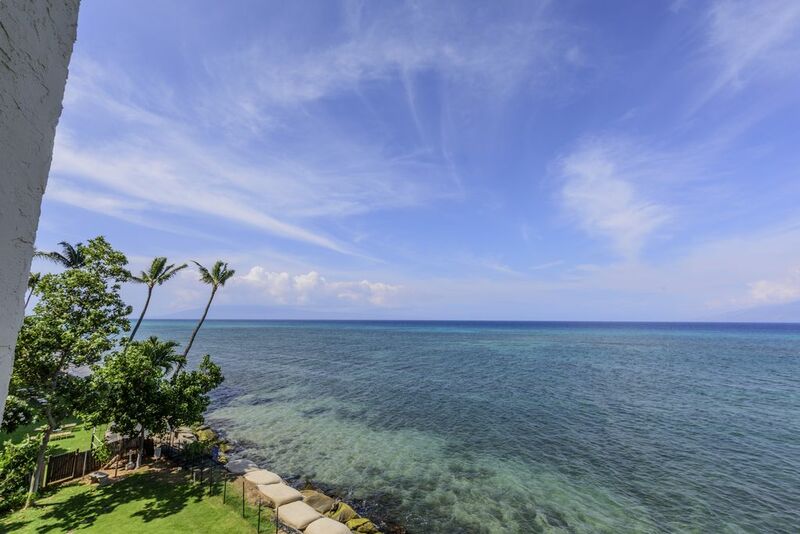 Enjoy unobstructed, 180-degree views of the outer islands and Lanai/Molokai channel. The best whale watching on the island can be found right off your own private lanais! The Hololani Resort is a quiet condominium complex located directly on the ocean in Kahana. This spacious condo of 1,050 square feet all on one level has been fully renovated in Fall 2009. It now offers porcelain ceramic tile floors; granite countertops; solid cherry wooden cabinets complete with accent lighting; stone & travertine showers and tub; premium appliances; three HDTVs; TEAC stereo system; and individual iPod decks in the bedrooms, among other luxuries. The condominium is decorated with an elegant tropical flair, including new, comfortable furnishings sprinkled with dramatic antique Oriental pieces. The all-new amenities are high-end, as well, with a degree of attention to detail that provides for everything from Henckels cutlery to Farberware cookware to a coffee bean grinder and a salad spinner! Beach chairs, beach towels, a cooler, iron & ironing board, and all other anticipated needs are met in this property. Two Master Suites offer plenty of room for up to six guests. Each bedroom has a queen-sized pillowtop bed (in addition, there is a queen-sized sleeper sofa situated in the Living area). The First Master Suite is separated from the Living Area by wooden pocket doors, and includes a stone & travertine shower. The Second Master Suite includes a stone & travertine full bathtub/shower combination. Finished closet space is abundant, including plenty of hanging, shelving, and storage areas. The property is centrally located between Kaanapali and Kapalua Resorts--all of Maui's most cherished activities are just minutes away. Shopping, along with dining are within walking distance. Free Secured Wireless Internet is available from inside the condo, and both parking and unlimited telephone service are also FREE! Choose this pristine condominium for your Maui stay, and truly experience paradise at its finest! Aloha, Quam Properties Hawaii, Inc. is conveniently located in West Maui at Napili Plaza Shopping Center. We provide a variety of services to West Maui and the neighbor islands. We are a family owned and operated management company with over 25 years experience in Hawaii. We have a full service, dedicated, friendly staff, and attention to details are our primary concern. Our services include Luxury Vacation Rentals and Concierge Service, Property Management, Association and Project Management, Long Term Rentals, and Real Estate Sales. Our office is open Monday through Friday from 8:00 AM to 5:00 PM and Saturday from 8:00 AM to 4:00 PM Hawaiian time. Quam Properties Hawaii requires a 50% credit card deposit. We accept Visa, MasterCard and/or Discover. VRBO does not give us your credit card information. They do collect your credit card for their service fee and we collect payment for the rental of the property separately. We will contact you directly for the 50% credit card deposit (or full payment if within 60 days of arrival). Reservations are not confirmed until then. You may cancel outside the 60 days prior to your arrival for a refund of your deposit minus a $100 cancellation fee. PROCESSING FEE - All reservations will be automatically charged a 3% processing fee on total amount of rental. This is not calculated on the quote that you get from VRBO. It will be added on at time of booking with Quam Properties Hawaii. 14.42% Tax added to all rates. Christmas/New Years have different minimum stays, please inquire with Quam Properties Hawaii. Mahalo, Quam Properties Hawaii! Located on the white sand of Kahana Beach. Telephone service offers FREE local and long distance calling! Excellent quality sheets and bedding. The washer/dryer are located inside the unit. A starter supply of laundry soap is provided! Underground parking garage with assigned parking. Plush bath and beach towels provided. Secured Wireless Internet is available from inside the condo! A starter pack of coffee is in the kitchen to get you going! Well stocked kitchen to cook a large meal! Three HDTVs--one in each bedroom and one in the Living Room. Beautiful place, woke to rainbows every morning. There was construction on the pool and the seawall but it never bothered us. Loved having a private lanai off the back bedroom. Would stay again. Great location, great condo unit. Wonderful double lanai for all day sun. The interior is beautiful and has everything we needed. We enjoyed great meals on the lanai and close walks to the beach. We will be back! Beautiful view! Nice, clean condo. We loved our stay, we will definitely be back! The view is most spectacular! Wide open ocean views from every room in this well appointed condo. The decor was perfect and comfy. Very clean with everything needed to enjoy your stay. The resident manager is very friendly and keeps the grounds beautiful. Great location, close to a couple of good happy hours. Highly recommend! We are a family of 5 and stayed for a full week. The unit worked out great for us. The pictures accurately represent the unit. We enjoyed beginning and ending each day on the balcony. Loved having a kitchen to start the day with breakfast. Enjoyed the spectacular view from the balcony of the adjacent islands and sunsets. As others have mentioned, the unit does not have A/C. While it was humid, and got hot during the day, the unit has ceiling fans which made it comfortable to sleep. Beautiful beach access is just a short walk away. Parking in a covered garage helped keep the car cool. The property management company was pleasant to deal with and responsive. Would stay again and would recommend to friends ! Been to Maui 6 times already and first time at this unit. As all other buildings in the area the complex is a bit old but well kept . They have someone clean those bbqs every single morning and they are spotless. The pool was also well kept. No beach access due to erosion but lots of beaches within walking distance so not an issue for us. The condo has been renovated recently and was immaculate. we honestly tried to find a negative but couldn't. The view, the breeze from the ocean, the location,, bathrooms were clean etc... Quam Properties manage the condo and bookings. They are very friendly and helpful if you have any questions. be ready for an additional 3% processing fee that is not mentionned on VRBO. I highly recommend this unit. Whale watching (seasonal) and Whalers Museum, sunset & dinner cruises, snorkel tours, Haleakala Volcano, local winery, Upcountry farms, Kite Surfing, Luau's, 'Ulalena' Live Theatre, and more!